Abstract: Preoperative anxiety in pediatric populations has been correlated with many adverse outcomes including increased pain, prolonged recovery, and maladaptive behaviors that can last from weeks to months or even into adulthood. The current use of pharmacological treatments can be difficult in terms of timing, predictability, and administration. As well, there is some question about the long-term consequences of the side effects on phobias, stress coping, and emotional or behavioral development. 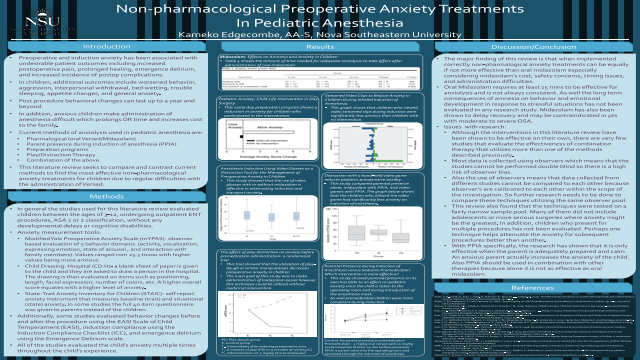 This literature review seeks to compare and contrast the efficacy of relatively low cost non-pharmacological anxiety treatments, so that children and their families have more favorable short and long-term outcomes.Summary: A literature review that looks at the current non-pharmalogical preoperative anxiety treatments for children. References: Aydin, G. B., Yuksel, S., Ergil, J., Polat, R., Akelma, F. K., Ekici, M., . . . Odabas, O. (2017). The effect of play distraction on anxiety before premedication administration: a randomized trial. Journal of Clinical Anesthesia, 36, 27-31. Bhalla, T., & Cartabuke, R. S. (2017, February 14). Mom...Stop stressing me out!! Parental presence and its effect on cortisol levels in children. 39, 32-33. Journal of Clinical Anesthesia. Brewer, S., Gleditsch, S. L., Syblik, D., Teitjens, M. E., & Vacik, H. W. (2006, February). Pediatric Anxiety: Child Life Intervention in Day Surgery. Journal of Pediatric Nursing, 21(1), 13-22. Kain, Z. N., Caldwell-Andrews, A. A., Maranets, I., McClain, B., Gaal, D., Mayes, L. C., . . . Zhang, H. (2004). Preoperative Anxiety and Emergence Delirium and Postoperative Maladaptive Behaviors. Anesthesia Analgesia, 99, 1648-54.